May 28, 2012: On June 4th, 2012, there's going to be a full Moon. According to Native American folklore it’s the Strawberry Moon, so-called because the short season for harvesting strawberries comes during the month of June. Because only a fraction of the Strawberry Moon is shadowed, astronomers call this a partial eclipse. But it's totally beautiful. 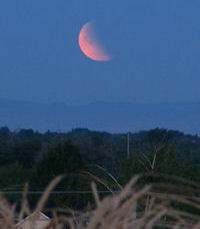 The eclipse is visible in North and South America, Australia, eastern parts of Asia and all across the Pacific Ocean. On the Atlantic side of the United States, the eclipse occurs just as the Moon is setting in the west--perfect timing for the Moon illusion. For reasons not fully understood by astronomers or psychologists, low-hanging Moons look unnaturally large when they beam through trees, buildings and other foreground objects. In fact, a low Moon is no wider than any other Moon--cameras prove it--but the human brain insists otherwise. The eclipsed moon, hanging low in the west at daybreak on June 4th, will seem extra-large to US observers east of the Mississippi. The fact that the extra size is just an illusion in no way detracts from its visual appeal. 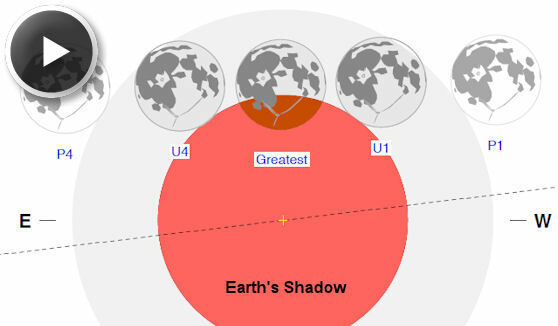 The sun-Earth-Moon alignment that causes this eclipse is the second of three rapid-fire celestial line-ups. First there was the annular solar eclipse of May 20th, when the Moon moved between Earth and the sun to turn our star into a “ring of fire.” The lunar eclipse of June 4th reverses the order of the Earth and moon, so that the moon is eclipsed instead of the sun. Finally, we have the transit of Venus on June 5th and 6th, when the second planet moves directly between the Earth and sun. Backyard astronomy doesn't get much better than this. Wake up before dawn on June 4th and savor the sweet eclipse of the Strawberry Moon.